We woke to another dull day, but at least it was a little milder. The cunning plan was to get up and dressed and try one of the cafes en-route to Kyle of Lochalsh for breakfast. None of them were open. Eh? It wasn’t that early! It was after 9! IN tourist season! Instead of eating out in Kyle yet again, we decided to go over the road bridge to Skye and eat there. Good plan! We ate at Saucy Mary’s, Kyleakin. Well, the cafe attached to it. The food was good, the staff were great with the minxes, the minxes were hungry. How more perfect do you need? Suitably refuelled, we looked at our large-scale map of the island. ‘Map’? It was a tourist picture pull-out from a magazine. Like someone had drawn it with a Mars Bar rather than a fine-nibbed pen. So we figured that we weren’t seeing much detail… Meh, where are the good topos when you need them?! The Boss and I agreed to just amble along and make decisions as and when. Although Plockton had been interesting to walk around the day before, we also agreed that the minxes really needed a day to run around properly, preferably on a nice beach. We drove down the east of the island and discovered that our tourist map’s idea of a sandy beach was in reality a muddy, tidal inlet. Picturesque and interesting, but not what we were looking for. So we stuck with our original loose plan and kept driving south to Armadale. We pitched up at the ferry terminal immediately into the arms of a man with a clipboard. Ten minutes later, he waved us on to the ferry, the last ones to board. Hooray! And as luck would have it, as we boarded, the sun came out! 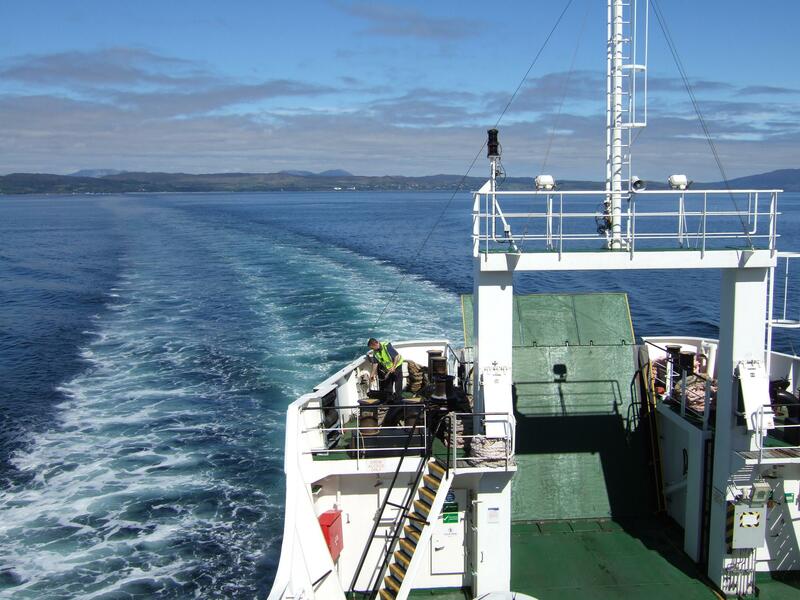 It was only a short wee trip to Mallaig, just over half an hour. Enough time to get cold in the wind on deck and buy some fudge from the little shop. We were one of the first off the ferry so could look around in bewilderment as we got off and went for the main road east. A lot of it paralleled the rail track. Unfortunately Boss the Bozo had had a mad 5 minutes and tidied up the car before we left. And binned my copies of where off the beaten track would be nice to visit. And how to get there. And all my painstakingly copied notes of when the steam trains arrived and departed Mallaig and Glenfinnan. So we couldn’t even decide whether to loiter in hope of catching a big rush of steam. It’ll take more than a beach of magic silver glitter to turn this one into an angel! sandy beach”. I lie – it was silver glitter. Proper silver sparkles! And more seashells than I have ever seen on one beach before. The minxes were so exited that all 3 had to poo within the first 20 minutes of getting there. The Boss got busy with spades and nappy sacks and generally went in a total grump about it. I made some smart-arse remarks about him enjoying a little sliver of my day-to-day life. He really appreciated that, I can tell you. Nappy flasher. She disnae get it fae me! 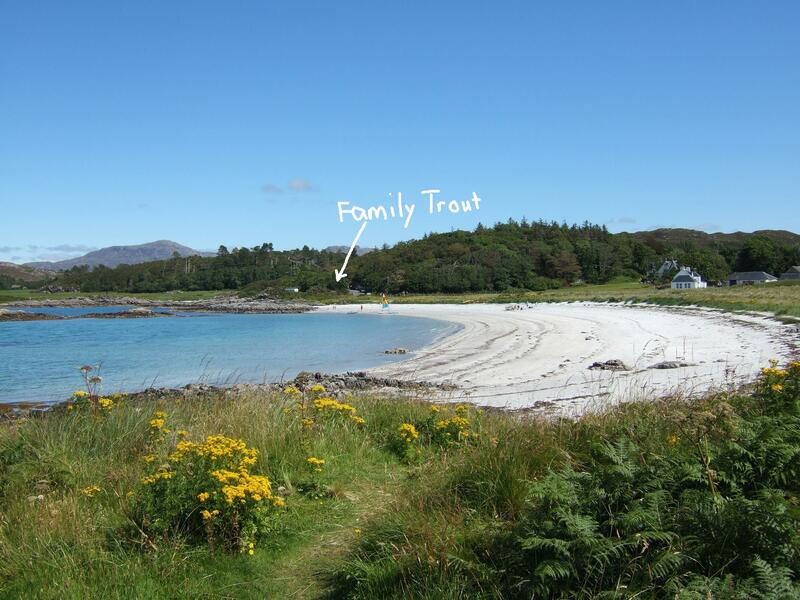 I can see why the Arisaig campsites were fully booked – what a sight! Deeply turquoise, perfectly clear water, backed by plum- and slate-coloured hills over a sky so blue that it looked fake. Dot some purple heather and yellow flowers along the edge of the silver-white sand and the blue-green pines and you can maybe see why my eyes loved it! Maxi Minx immediately set to work building a sandcastle, so I went off in search of a few hundredweight of pink, white and blue shells to decorate it. 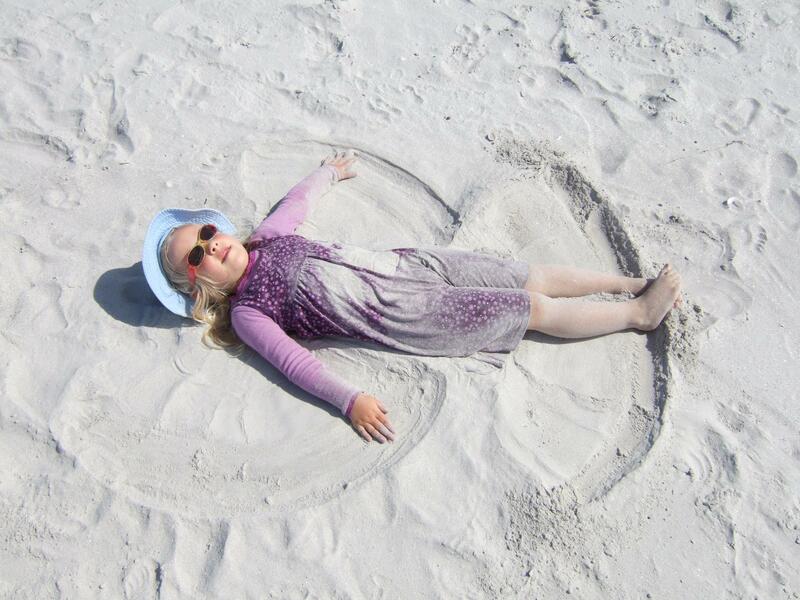 Mini, meanwhile, enjoyed splashing in the sea, while Midi muttered about sand-angels. We spent maybe 2 hours playing on the beach and enjoying the warm sunshine before deciding that we really should go and get some lunch. 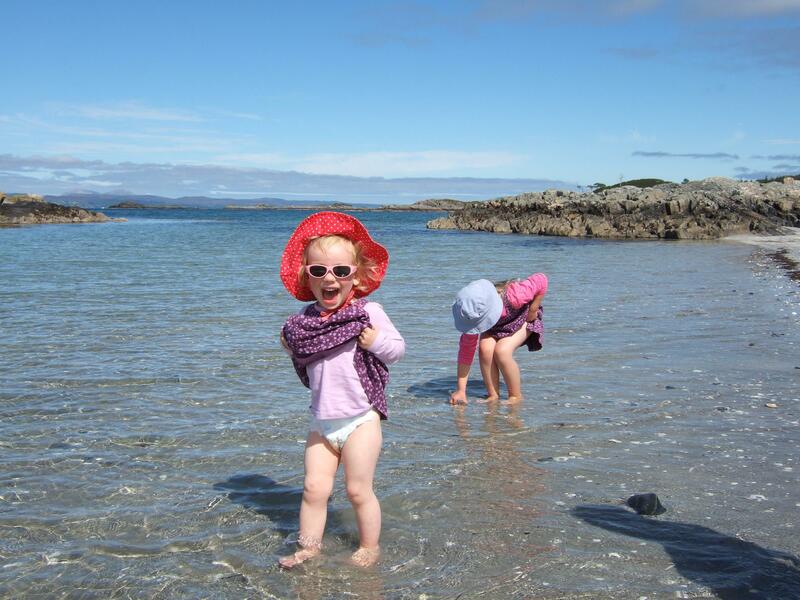 We thought we’d be ok grabbing something in Arisaig just after 2pm. Nope: everywhere had finished serving food or had shut. Fair enough, I suppose, so we did a provisions run at the local Co-op. I get even grumpier when I’m hungry, so piled in all kinds of party food to the basket: sausage rolls, pork pies, crisps… Midi developed a sudden love for chicken satay on a skewer after trying some 2 days previously in a quick Co-op late lunch stop in Inverness, so she had to have that. Maxi had to have Ribena. Mini had to have chocolate mini-rolls. The Boss gamely tried to feed us some healthy wholemeal bread he’d joined together with slices of ham, but the minxes are definitely my daughters; we mutinously munched our way through pastry and chicken. Refuelled, we decided that as we wanted to stop off in Glenfinnan and it was already 4pm, we’d better start back on the long road to the campsite. 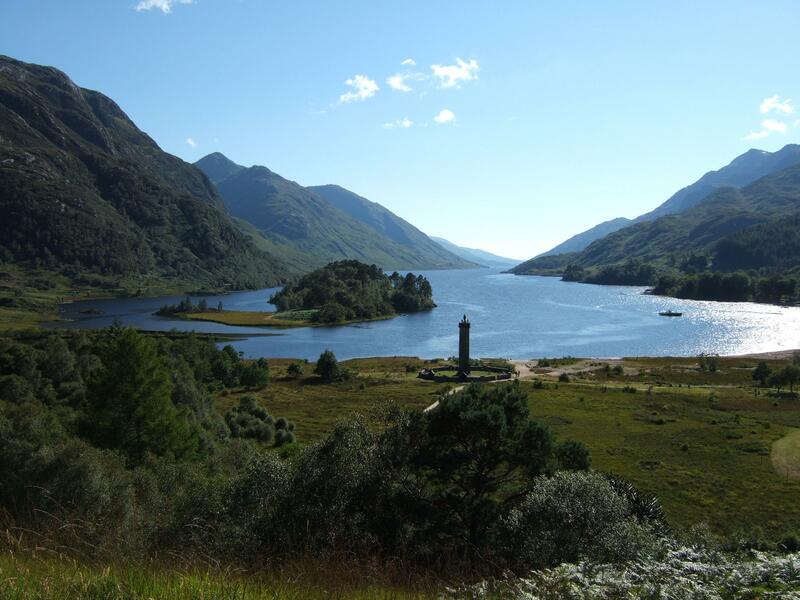 The weather held, and the clear sky let us grown-ups get some fantastic views of the lochs and mountains. Maxi was too busy reading Anne of Green Gables to notice much, and her sisters wanted to nap their lunches down. 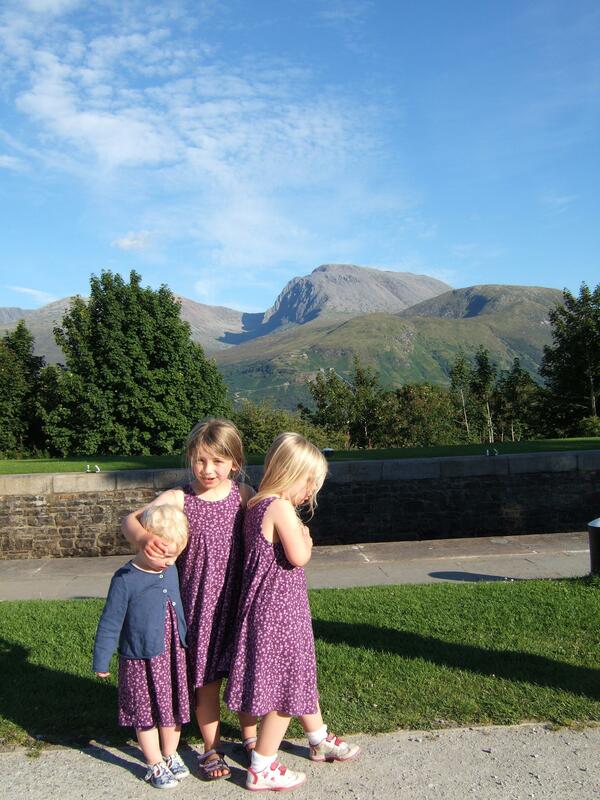 When we got to Glenfinnan, all the girls were sleeping. I cursed The Boss again for discarding my sheets with the notes of where to walk to get the nicest views. Instead, I nipped up some steps at the back of the tourist centre to see where they led to, anyway. The signs warned that the path was tricky and recommended strong walking boots; I made do with my old, bash, plastic purple crocs. The path zigzagged up to a little viewpoint, and reminded me a lot of the path up Gibraltar Rock, on which I spent many a scary weekend afternoon in 1995 (I get vertigo, and in those days I spent most weekends with a hangover. Well, the G&Ts at Happy Hour were 20p. And I was young and carefree…). The view over the viaduct was nice enough, but I much preferred the view over the monument to the last Jacobite Uprising. I waved to a newly-awoken Maxi and The Boss in the car park, could see that he’d got the coffee pot and gas burner out, so zoomed back down in time for an espresso. 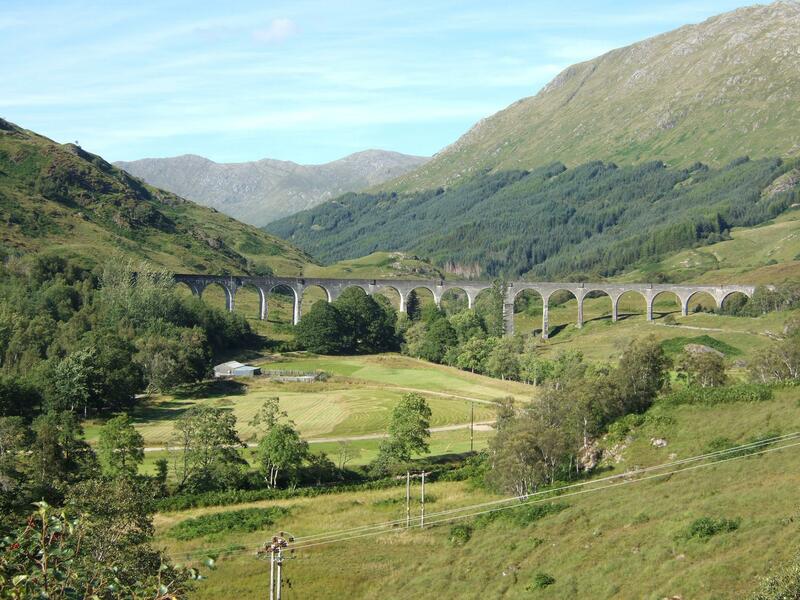 Maxi was impressed by the viaduct’s links to Harry Potter, so The Boss took her and Mini to see it a different way, while I spent a happy half-hour minding snoring Midi in the car, contentedly poring over some maps. So it’s a mountain…big deal, Mummy! real thing didn’t help. They weren’t impressed at seeing the highest mountain in the UK, either, so I decided it was time to pull out the joker card and let them run loose in the playground. We all had a brilliant half hour until the midge levels picked up from zilch to getting-on-my-wick levels. To wails of “Noooooo! 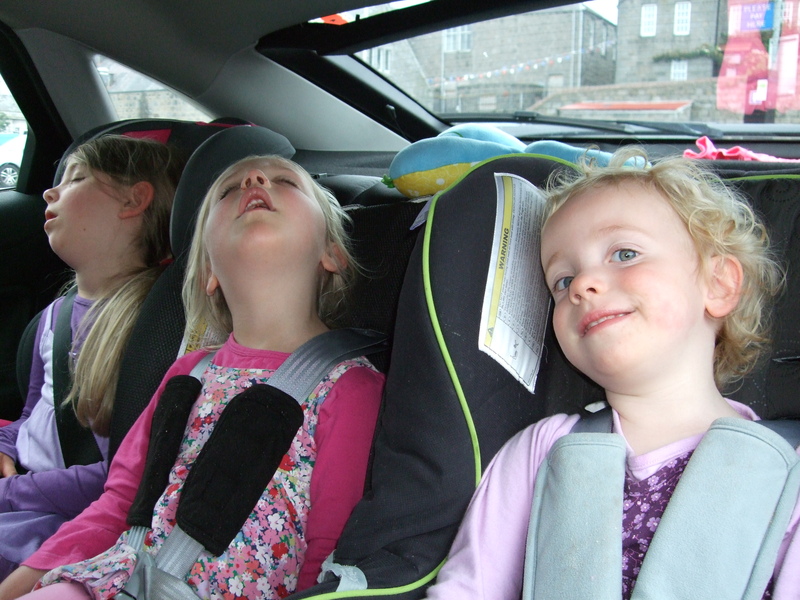 I want more swings!” we drove on to Spean Bridge for fish and chips and another leg stretch. After eating, the minxes passed out, leaving the grown-ups to admire the sunset in the mountains. 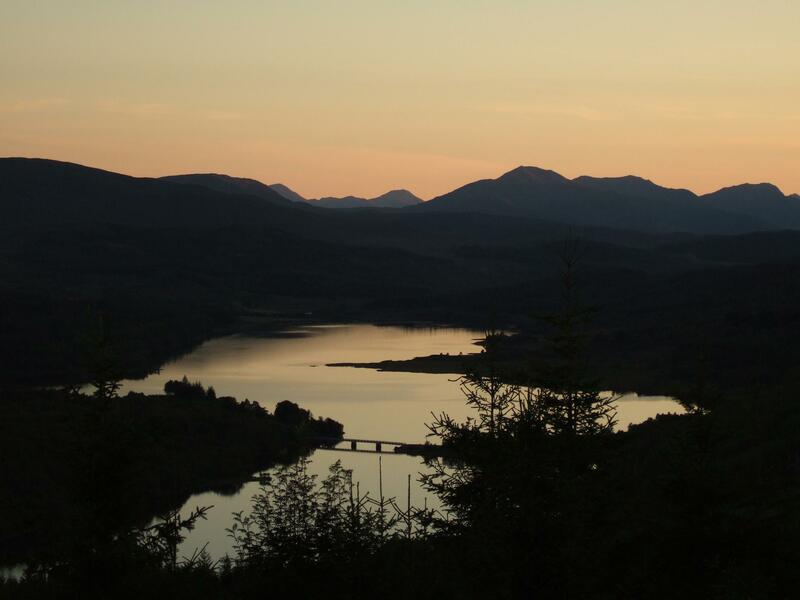 We arrived back at the campsite long after the midges had gone to their beds – result! The first day camping dawned misty, cold and wet. Oh no! But at our last check of the area met forecast, we were heading for 5 days of sun, sun, sun! That was the morning when I first suspected that the Met Office forecasting had been left in the sole charge of Colin, the Janitor’s Dog, while the actual forecasters were off on their jollies. So, stopping for a quick photo of Eilean Donan castle again, we headed back to Kyle of Lochalsh, back to Hector’s Bothy, for a Billy Big Boy Fill My Belly With Yumminess fried breakfast. Lovely! It hit the spot. Even though Mini Minx nicked everyone’s black pudding. The mug that fit nearly a pint of coffee definitely set me up for the day. By the time we’d finished, the cloud had lifted a little, so we decided to act like tourists and go on the second cruise of the day on the Atlantis Sea Probe Glass Bottom Boat. While we waited on the tour, we went for a little explore. I don’t know about you, but I can’t resist steps, especially if they lead out of sight. I have to climb to the top, to see what I can see, I suppose; to see what they’ve been put there for. So plodding uphill we found some steps. And broke through to a viewpoint, over to Skye. It was very scenic and quite special. Speaking of which, I wasn’t expecting much of the glass-bottom boat trip. Especially when I saw the faces of the Dawn of the Dead passengers from the first cruise. But oh my word, it was fascinating! One of the crew members just chatted away, telling anyone who wanted to listen all about the area: the landscape, the sealife, some history, fascinating facts. The trip was far too short, and we all really enjoyed it. The minxes loved seeing the seals, I liked the big starfish underwater, and Mini dropped her obsession with baked beans and transferred it to seaweed. We stopped at a little shack on the sea-front for the most tasty seafood rolls I’ve ever tasted, then drove over the twisty roads to Plockton. Boy, did The Boss ever get some practice manoeuvring the car about! Descending into the wee village, the sun came out. Mini need a nap, but the elder minxes and me were in desperate need of burning off some energy. So she went in a sling, the others got their buckets, I rolled up my jeans and blinded the village with my blue-white pins, and off we plodded around the harbour. Remember what I was saying about steps? Well, we saw some narrow ones heading out of sight. So we climbed all 65 of them, wondering what was at the top. Oh. Just a farm track. That led back to the village! Still, we saw a man scything his field. And the path did lead to the ice-cream shop. By this stage, the minxes thought we were going on an ice cream tour of the Highlands. On the long drive back, we realised that Midi hadn’t burned off enough steam, as she treated us to her ‘opera singing’. Sounded like a pod of dolphins screaming along to a Bjork song, to me. My poor ears!! It was still a nice night so The Boss cooked up some Pasta ‘n’ Sauce with extra broccoli and peas stirred in. The minxes loved it, but Maxi got very upset at us not being as bothered about who ate what from which colour of bowl as she was (“No, no, Mummy, yours is the red one!” But I want a big portion – I’m hungry. And I need more food than you. And the red has the littlest portion. “But yours is red! And mine is blue! Don’t you see?” No. Gimme.) We discovered that kids will eat *anything* if you cook it on an open flame (and give them the bowl of their chosen colour…). That night they didn’t sleep till late. Hey-ho. At least the campers next to us last night had moved on (oops). That’ll teach me to write a huge post – I lost it all in a WordPress wobble. It was only about the one, single time in my life when I juggled all my plates and WON! Sheesh. 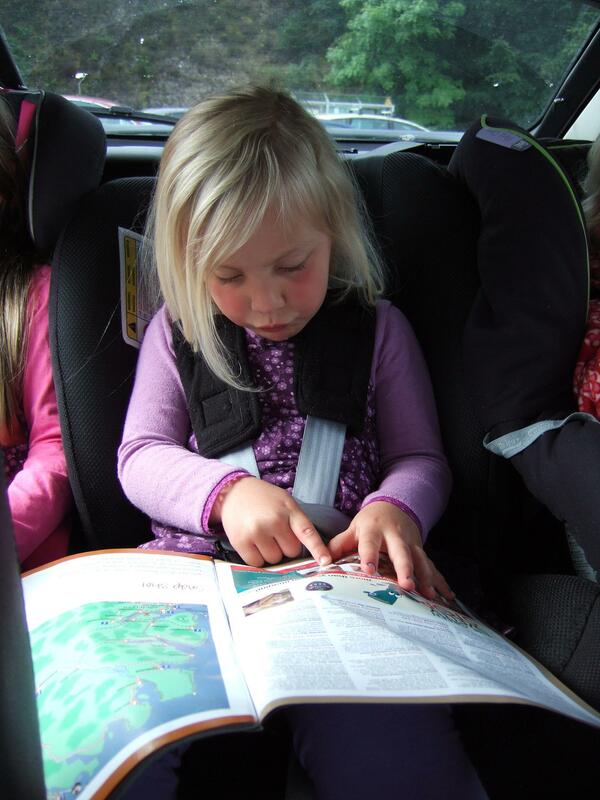 I’ll rewrite it another time… Time to crack on with the story of going on our second camping trip, to Shiel Bridge. 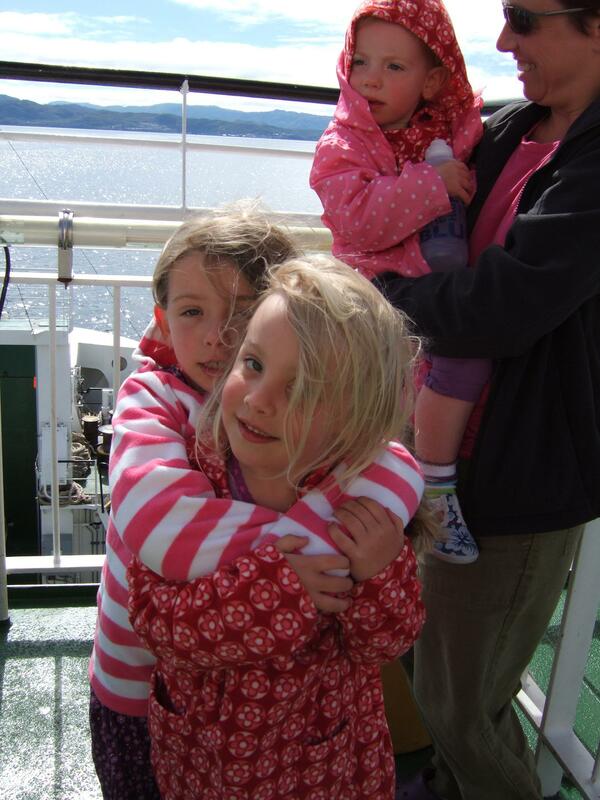 Well, we meant to go to Arisaig. But every campsite was full. So I looked a bit further. Full. And further still. The first place with spaces was Morvich Caravan Club site. Eep. Sounded posh. But it was open to non-members and as cheap as anywhere else. So on 8 Aug, Maxi Minx passed her Bete Noir swimming test (! ), The Boss sold the old car, Midi and Mini helped me cram stuff into the boot of the inherited car, and by midday we were off! Into sunshine! 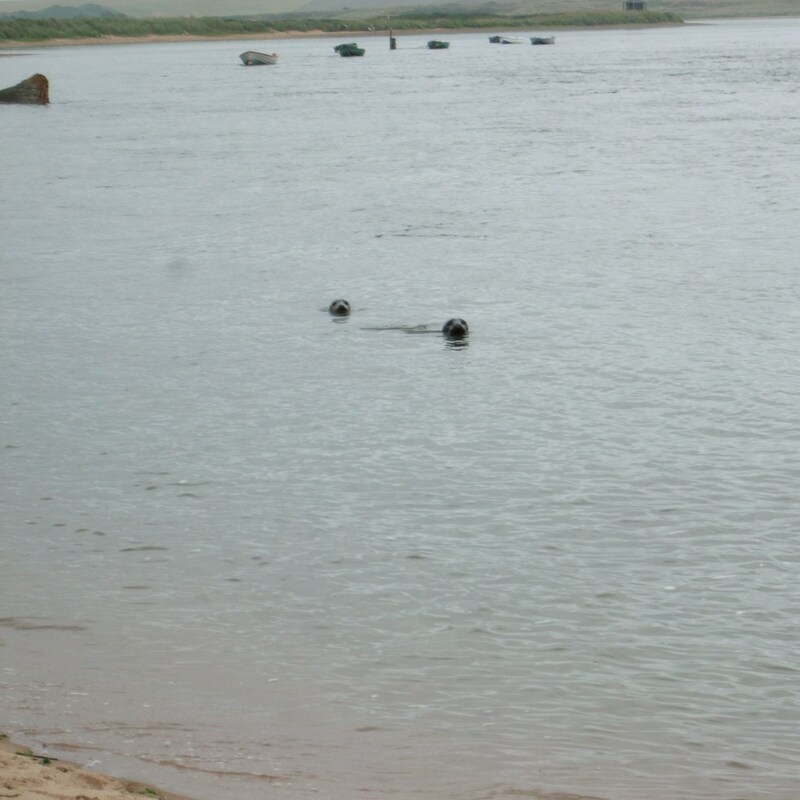 Maxi and Midi know that the Loch Ness Monster was actually a bathing elephant from a travelling circus troupe, but it didn’t stop them searching the glittering waters as we zoomed by. I was on a mission to get to Shiel Bridge at a reasonable time! Around 4pm we arrived to… manicured, clean, perfect SILENCE. 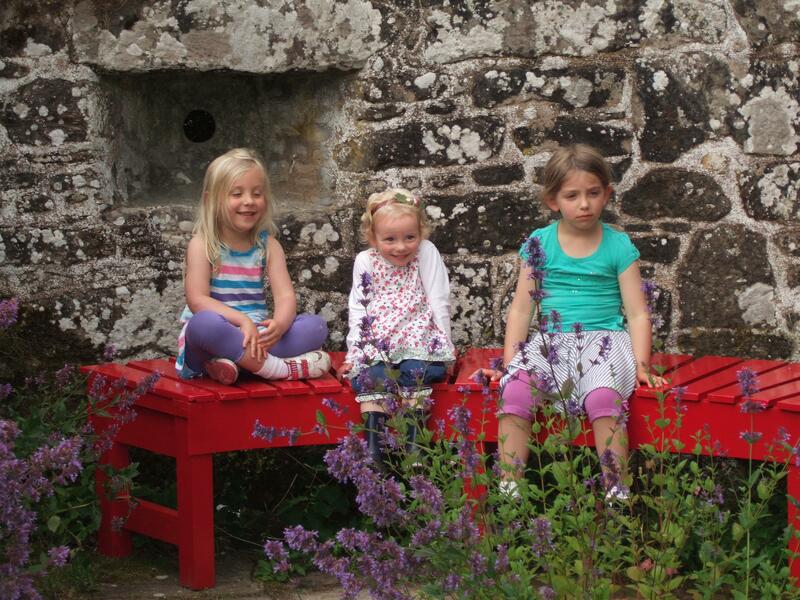 Oh my word… How long would it take my noisy girls to get us turfed out for being too loud? Still, we set up the massive tent and strung up the solar-powered fairy lights that I’d nabbed for £2.50 from ASDA (result! Perfect night-lights, and saved on torch batteries). We spent a while admiring the incredible views from each of the tent doors then nipped down to the Jacobite for dinner. Alas, their card-reader was broken, and The Boss had totally forgotten (hmmm… should that be in inverted commas?) my reminders about getting cash out. So we’d no option but to go into Kyle of Lochalsh. As it turned out, that was a good decision. We ate a fairly nice meal at Hector’s Bothy (nothing wrong with it at all if I’d been in the mood for fried stuff. But oh my word, the side salad was incredible! Flowers and very fresh herbs and white lettuce! I could have eaten a plate of that alone, and I’m a renowned salad-dodger) then went for a bimble for ice-cream. Hectors2Go was the source. After 8, chocolate orange and bubble-gum ice-cream all round. The server was a completely child-friendly star, being indulgent of my capricious minxes, who kept changing their minds about whether they wanted tubs or cones (he gave them both, for no extra). Midi instantly dropped her ice cream on the floor. He replaced it for free and graciously let me clear it up. And the ice cream was lovely, too! We sat outside, braving the first of the midges, gazing at the view of the brooding Cuillins behind the Skye Road Bridge. What caught my attention, though, was the beautiful little ice-crystal fire rainbow. Eventually, though, the midges got my undivided attention, and I legged it to the car. On the way back to the campsite, we had to do a quick stop at Eilean Donan castle – the evening sun! the reflections! the colours! 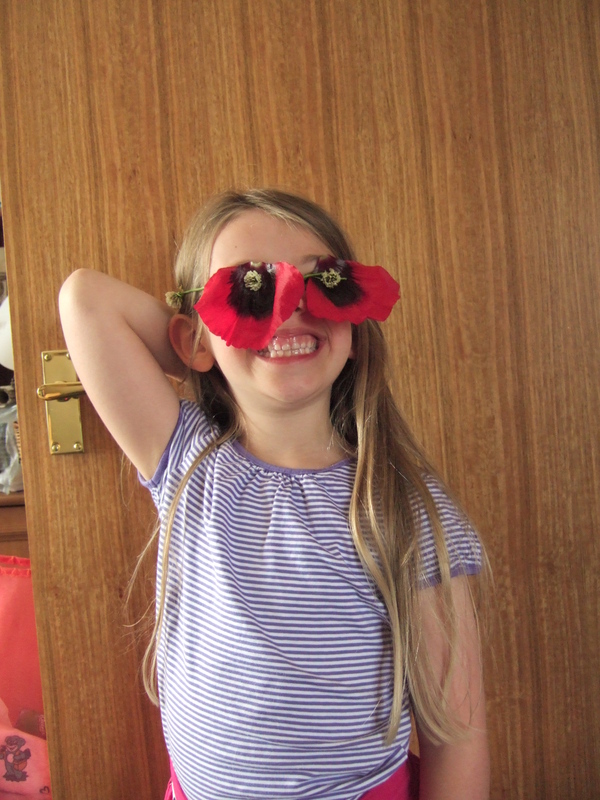 …the bloody midges! I was wiping the little buggers out of my nose and ears. Luckily none actually bit, so I guess the Smidge does work. 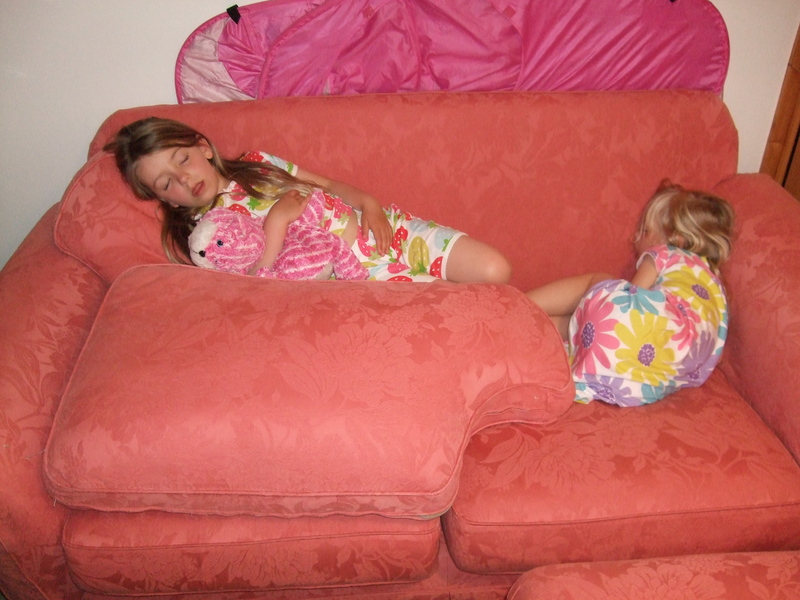 The girls snuggled up in sleeping bags but didn’t even pretend they were going to sleep. I think they eventually passed out about 2245hrs, Maxi face-down into the 10p copy of Anne of Green Gables I’d bought for her ‘in 5 or 6 years’ at the school fete. I stopped cringing about the decibel levels their screeching had reached about 1am… And yet again I was soooo glad that we’d brought a potty: even 6 year olds struggle to hold it all in when they have to wriggle out of sleeping bags, find a zip, unzip, find a jacket, find wellies, find a torch, find one that works, find a parent, wake said parent, struggle out of more zips, scuttle down to the toilet block. Alas, though, us adults had to make the midnight runs to the toilet block. Still, the amazingly clear views of the beautiful Milky Way made up for the freezing cold. Over 4 years ago, I got to know electronically a group of pregnant women whose babies were due in the same month as Midi Minx. Although I was a second-timer, I really enjoyed blethering about our pregnancies online, taking regular time to myself to think only of me and my unborn baby. I made a couple of very good friends who I still keep in touch with. One of them, S, even inspired me to start my own business after she did, leading by her example. I met S and her little girl, L, for the first time in real life 2 years ago, and again a few times since. The weekend of 4-6 August 2012, though, they came for a sleepover. 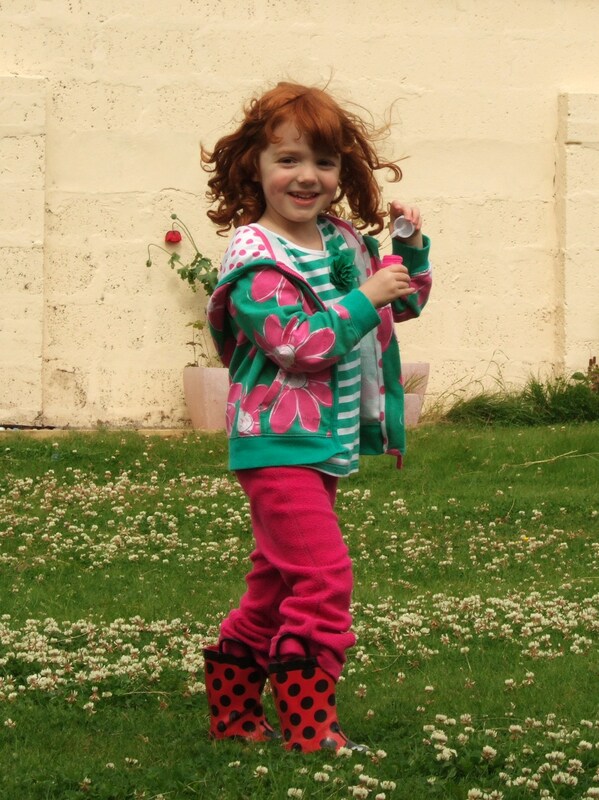 L is a beautiful, bright, girly, bubbly little thing with the most stunning red, curly hair: a true Princess Merida Minx. My minxes were as excited about meeting her as they would have been with real royalty. They both arrived in time for tea on the Saturday. Although my minxes were on their best behaviour, they make a lot of noise and mess. No really, a LOT. Chimps tea parties are more civilised. Merida took it all in her stride, enjoyed Maxi and Midi fawning over her, and decided that she would indeed share a bedroom with them rather than take the spare room with her mummy. I think around 2230hrs we gave up trying to get them to sleep. About 2330hrs they stopped talking. At 2345hrs Merida went to share a bed with her mummy: Midi’s snoring was keeping her awake. 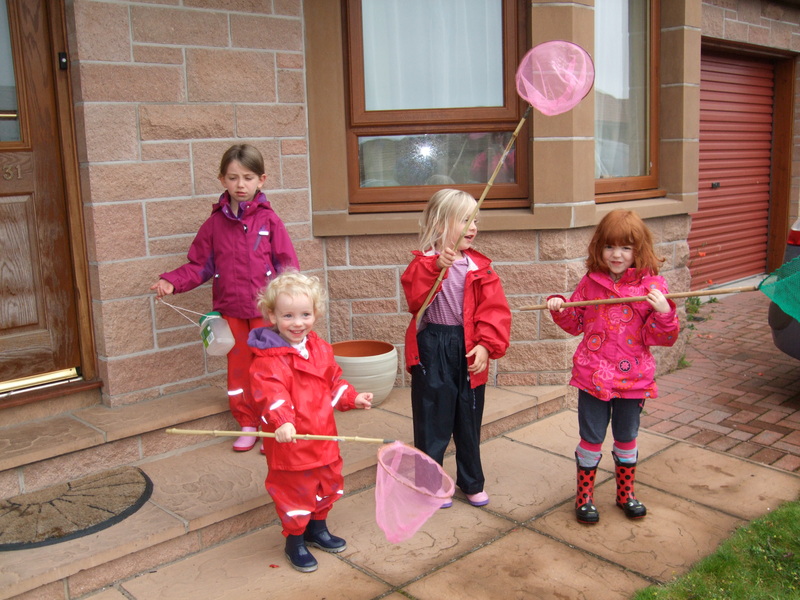 The next day we went for a shamble around the beach and my girls bickered over who was having which pink fishing net. Foster Cat decided that we 3 adults obviously weren’t fit guardians over the 4 girls so he followed us all the way down. 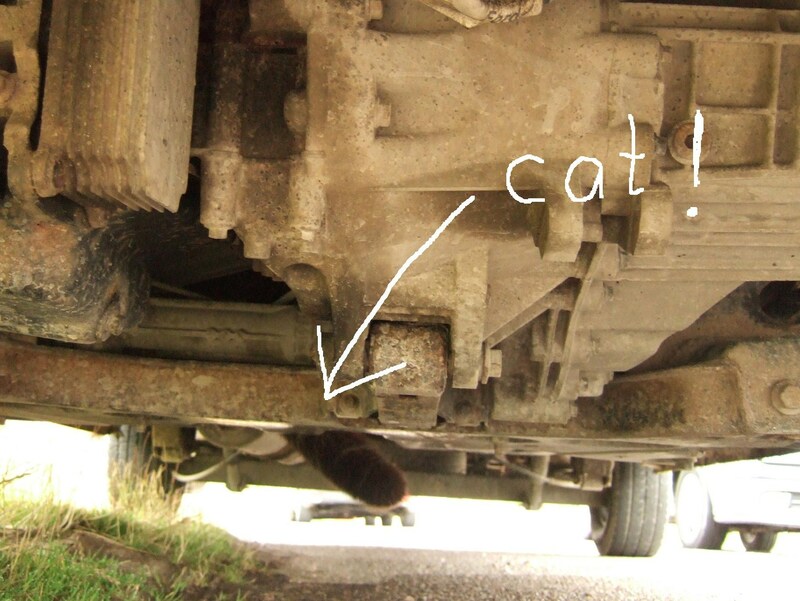 (Killer Cat doesn’t give 2 hoots). He eventually bottled it a few yards from the sand and found a nice van to curl up in. I think he balanced on the wishbone. And there he stayed for the next 90 mins till we came home again, where S demonstrated that she is also a skilled Cat Whisperer, and carried him home. 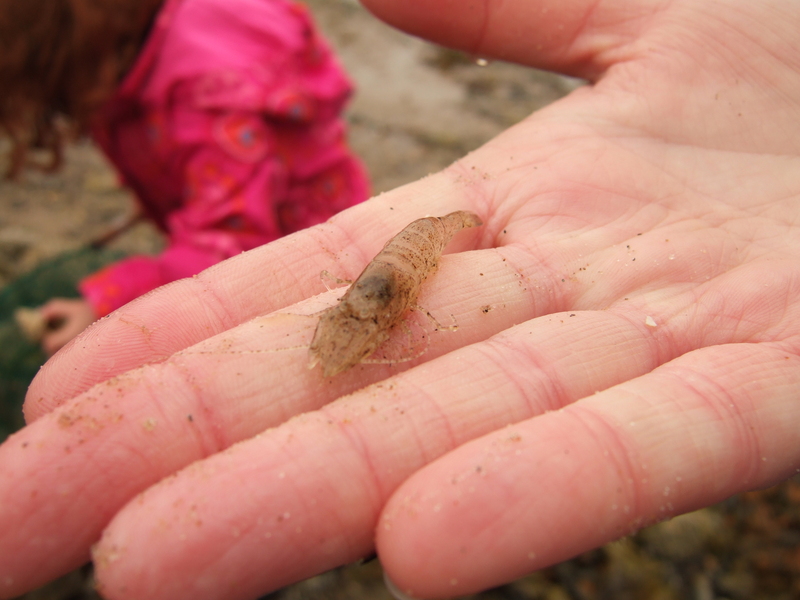 The rockpooling was fun: we found 2 star-fish, a baby langoustine, more baby whelks (bigger and yellower, this time) and some beautiful frilly white seaweed. 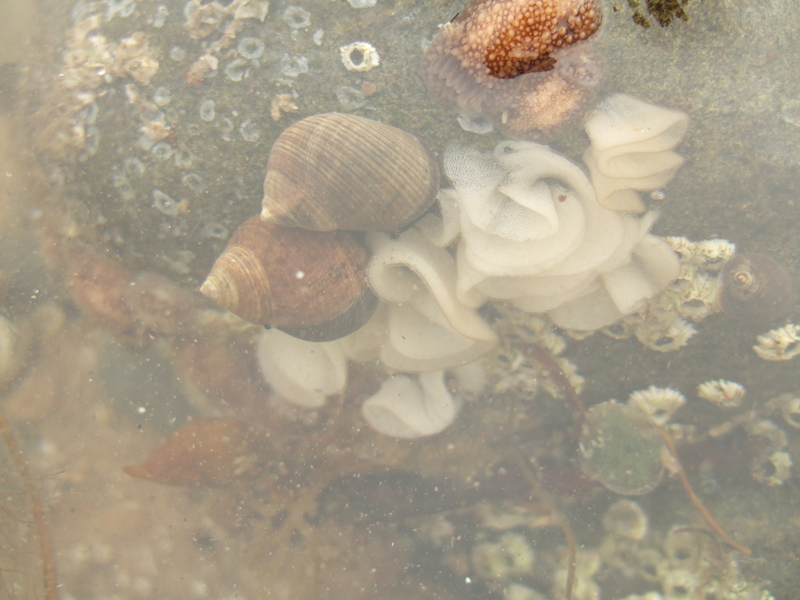 Well, I asked around on Facebook and Someone Who Knows About These Things suggested it might be bleached out Furbellows (Saccorhiza polyschides), a brown algae. That’s pretty cool, as that was my uneducated conclusion from studying Google images! 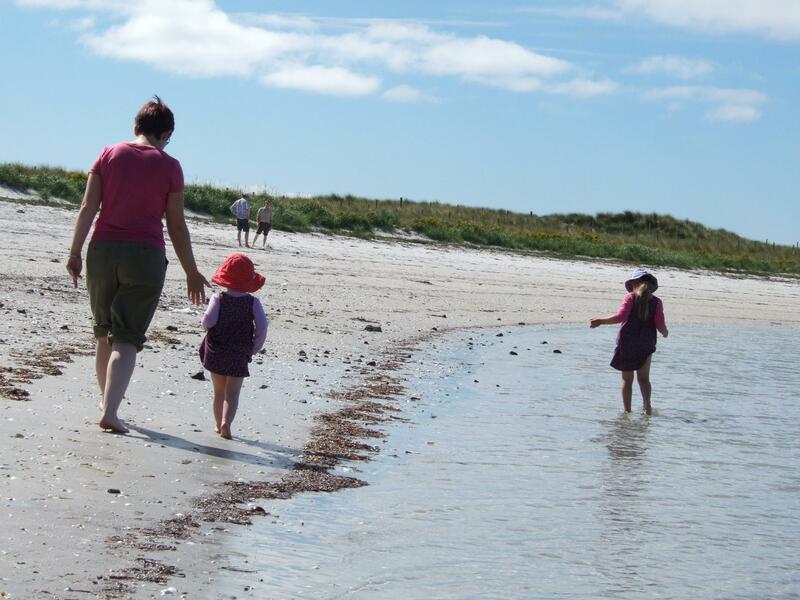 Anyway, as the tide was out I thought the girls would have a lovely long afternoon turning over rocks. But poor Merida Minx almost immediately slipped and tumbled bum-first into a rockpool. Luckily I’d brought a change of clothes, but it meant that the next girl to get wet would stay wet. So we didn’t hang around all that long. Back at the ranch, the girls got dressed-up as princesses (obviously) then had fun bounding around on the seesaw and blowing bubbles. 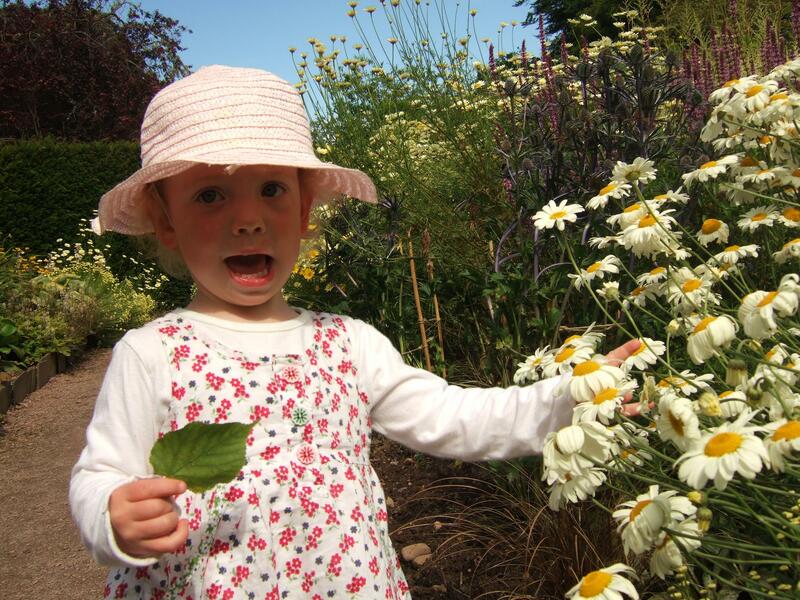 Merida enjoyed picking peas, broad beans, lettuce and guddling for potatoes in the garden. Four is sometimes a tricky age to eat meal after meal of food that tastes or looks a bit different to what you’re used to – my home-made lemon drizzle cake, and a mountain of watermelon and cherries might sound nice to an adult, but aren’t to all children’s tastes – but Merida was a star, trying everything and enjoying most. The next night, I think the girls gave up yapping a bit earlier – 2330hrs. None of them were happy bunnies on that Monday morning! They even sat and watched CBeebies. Unfortunately Maxi had a swimming lesson, so we had to hot-foot to the pool while Merida and her mummy went home, with lots of sleepy “Safe journey!” “Bye-bye” and “I love you” (from Mini) ringing in their ears. I hope it’s not long before we meet back up again. 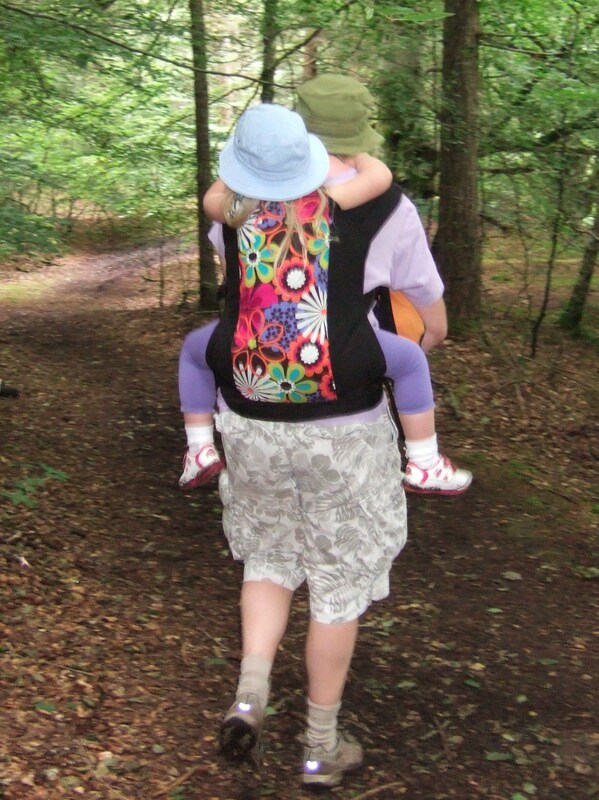 Predictably Mini fell asleep in a sling on my back and Midi refused to walk further than a mile. Luckily wily old me brought along a pre-school carrier that she fit into. She loved it, but neither me nor The Boss could get on with the shoulder straps, so despite being as-new, it’s been sold. 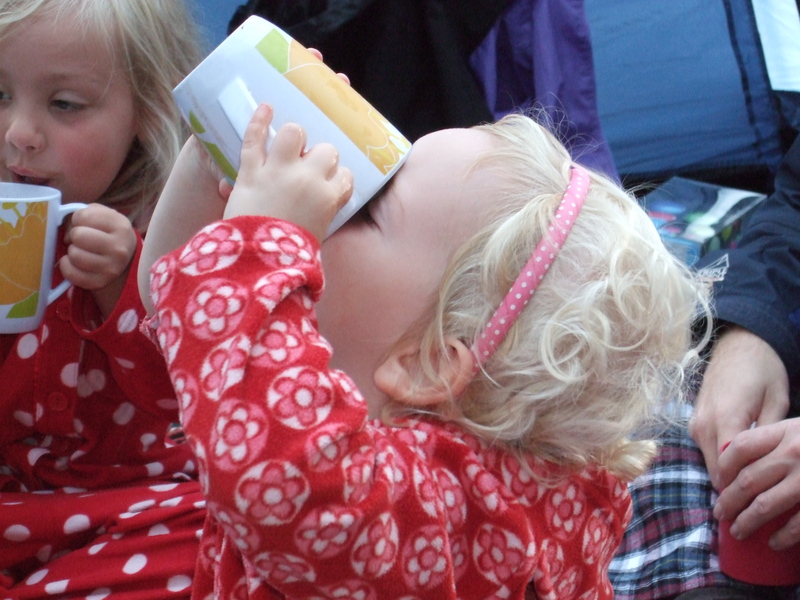 I told you all about our first proper camping trip; but we actually did a lot more than just hang about the (huge, blue) tent. First stop en-route was a cafe in Huntly. I only mention it because it was suddenly-sophisticated Maxi Minx’s first taste of an ice-cream float. 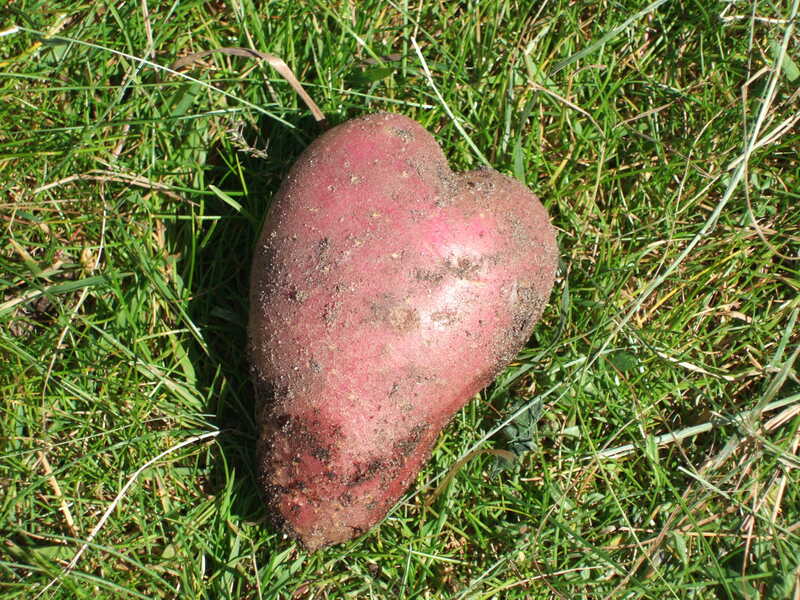 It went well with her jacket potato and tuna mayonnaise. How can I possibly have a daughter both old enough and aware enough of her own tastes to order jacket potato and tuna mayonnaise?! I nearly burst with pride*. It’s not something I make at home. I guess she must have been experimenting with new tastes at her weekly school dinner? *I know that’s probably a strange reaction. It’s hard to say why I felt so proud. The best I can describe is that it’s just another little step in her journey from being a totally dependent little infant to her being a hopefully self-confident, independent woman. Yes, each step takes her further from me; my control; my influence; my tastes. But it also takes her closer to our joint goal. Anyway, 1 August dawned wet and fairly chilly, so we felt no guilt at all about heading for the Satrosphere rather than staying outdoors. We’d been to the Glasgow Science Centre earlier in the summer holidays; I knew that was much larger, so tried not to expect a similar level of fun. Even so, I still wasn’t as impressed as I’d hoped I might have been. It wasn’t just that it was a lot (an awful lot) smaller: it was mostly on the customer side. I am the Queen of Discount Codes and Vouchers. I have to be! So I barreled up to the entrance to pay and happily quoted a discount code that they’d been promoting on Facebook. Blank faces. Could I provide a voucher? I explained that the post I’d quoted from had stated twice that you didn’t need a print-out, just quote the code. No. nothing. Luckily I’d taken along a separate paper discount voucher. I felt quite miffed because when I checked again later, I had indeed quoted the correct code. Maxi and Midi almost immediately zoomed off to one of the wee workshops in the bowels of the building. That was very well run and the girls enjoyed it. Certainly, the staff they had explaining the exhibits, experiments and running the workshops were entirely excellent: motivated, engaging, passionate and fun. But the restaurant? Oh dear… We arrived as the huge rainy school holiday rush had started to die down. We ordered 5 simple lunches and found some seats. Lunch (sandwiches) took 40 minutes to arrive. Well, some of it – some of it came much later after I chased it up. And again for the juice cartons. I wasn’t having a great day, so was easily persuaded to have some cake. The Boss paid with a £10 note. The server gave him the cake and turned to serve the next person. He politely asked for his change. He was given a few coins. He pointed out he’d paid with a tenner. Ah. The manager would have to come and do a complete till check before he could get the rest of his change, even though the server agreed that he’d paid with a tenner. It took the manager quite a while to do that… then he still got the change wrong. So they had to do another till check. It’s not often I have a lunch that lasts 2 hours and that I don’t enjoy. Perhaps we were just unlucky. 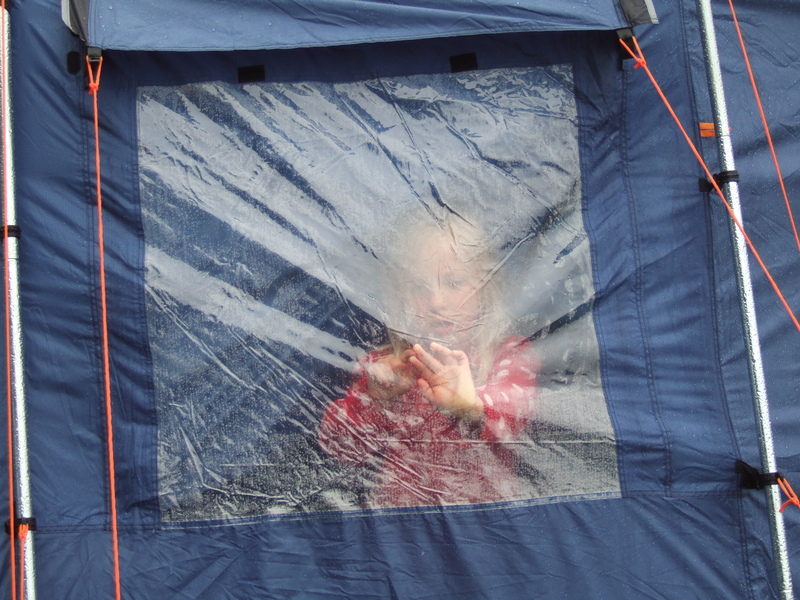 Desperate to get outdoors (I don’t care if it’s bucketing down – I’ve lost the will to live stuck in there all day!! ), we walked past the circus setting up and on to the Pleasure Beach. The Boss has a real thing against carnival-type things, but I guess the morning must have affected him too: he happily encouraged the minxes to go on some fair rides. They went on the ferris wheel first while I took photos, then me and Maxi went off to do a rollercoaster. 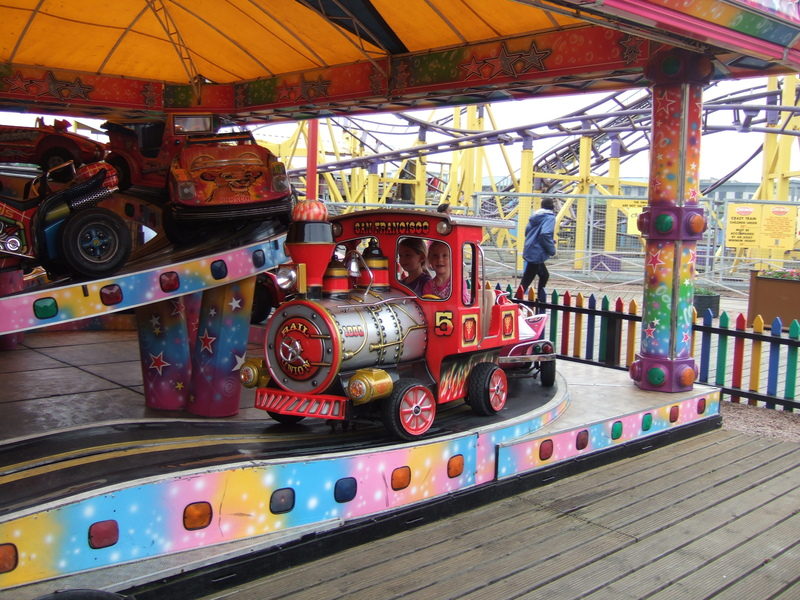 Alas, my grown-up girl screamed so loudly that she hated it and wanted to get off that that is exactly what happened – the man operating the ride stopped it, let her off and even gave us a complete refund, bless him. 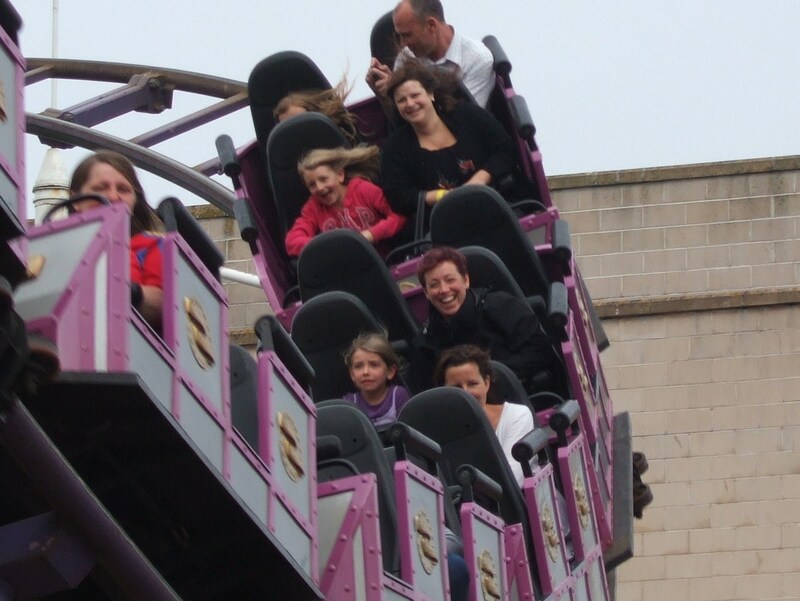 So we sent her onto the baby coaster – I guess her developmental journey in adventure and risk-taking will be longer than I first thought… Mini went on her first rollercoaster too, with The Boss. Poor lambs, both of them! She wasn’t too happy, and he looked so distressed at her obvious discomfort! So by this point, Maxi’s been in floods of tears, Mini’s leaked a few. Back to Maxi again: she took a wrong turning while walking through the penny slot machines and got ‘lost’ (she wasn’t – I could see her). She instantly panicked and shrieked hysterically. I scooped her up and we decided to call it quits and go to the swings, especially as it had stopped raining. Well, I guess it was Midi’s turn, now: en-route she stumbled over her feet in a perfect prat-fall straight onto her little knees. She shredded her leggings and most of her knee skin, poor baby. Luckily we’d packed big graze dressings in the first aid kit in the car, so The Boss legged it back for them. Newly papered up, we finally made it to the swings and they had a great time. Keen to try something new (and remember: it wasn’t me who forgot the cutlery and plates 😉 ) we went to Christos Greek Taverna as soon as it opened. The staff were lovely to our very tired little girls and the food was truly tasty and delicious – Maxi developed an instant love for moussaka. It was very busy on a Wednesday night, and I could see why. It’s the kind of place I’d love to go back to. The only dampener on it was that the baby change table was pretty liberally smeared with poo. Not necessarily the restaurant’s fault (why didn’t the parent clean up afterwards? What’s wrong with some people?! ), but I guess it means that it didn’t get checked or cleaned from at least the previous day. I know that I or The Boss should have told the restaurant, but to be honest I found it difficult to without sounding like I was complaining. And I was exhausted. And all 3 minxes were playing up / falling asleep in their dinners. So in summary: do, do, do go there, you will absolutely love the experience. But use your own change mat, like we did. 2 August was just as rainy and dreich as the day before. We’d left the cats to fend for themselves (!! They had lots of food left out for them, even more water, toys, soft places to sleep, had the run of the living room and halls, and we’d filled 4 litter trays, including the massive oven-grill-tray-soaker thing) so decided not to take tooooo long about returning home. I’m not sure why we decided to have a look at the beach near Newburgh, perhaps because we were getting beach withdrawal symptoms? Fancy some minx ‘n’ chips, Sidney? We parked up behind the golf course and unleashed the minxes into the sand dunes. As we came up to the coast, it was quite eerie and mystical, with the black sky and sea mist changing your colour perception and deadening all sounds. Lots of the pebbles were flat and smooth so I had some fun skimming them. I’m overjoyed at getting 4 jumps; The Boss is the family ciampione at that. Maxi tried one – plop. 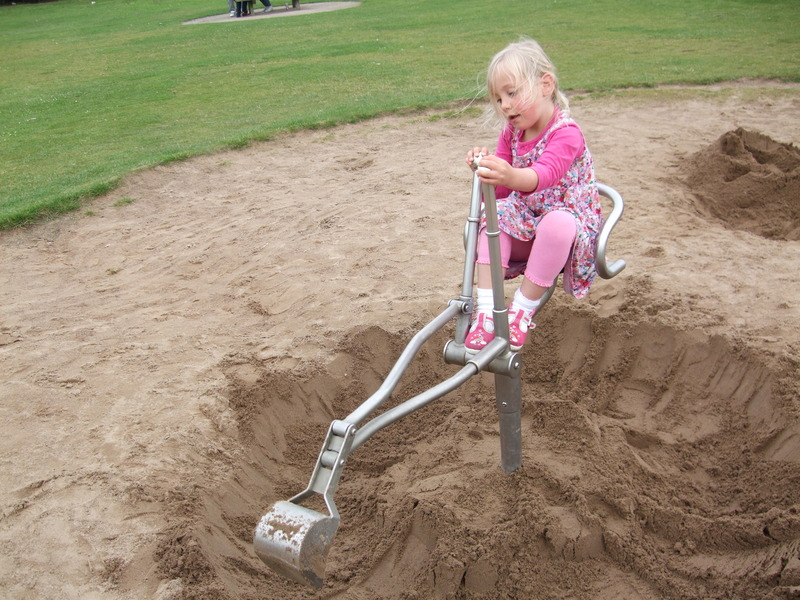 Mini tried one – she barely moved it 3 inches with her gentle little fingers. Midi tried one – SPLOSH! Right out by the fishing boats. A little black head popped up. Oh crap, was my first thought, we’ve been disturbing divers! Then I saw its dead-skull eyes… it was a seal! I shouted all excitedly to The Boss and the kids behind me. They just pointed over towards the surf – there were absolutely dozens of them, all rolling, diving, playing, right next to the shoreline. We walked up towards the coast-proper, checking them out. There were a pair that were paying very close attention to little Mini. Perhaps they were weighing up whether she’d taste better than fish? Or maybe they really were listening to Maxi’s Hello Little Seals whistle-song that she made up? Sadly, hungry tummies of our own forced us onwards and back on the road to home. And I tell you, after 2 nights of sleeping awkwardly and badly, there really is nothing like your own bed. Even if it gets rudely invaded with minxes throughout the night. 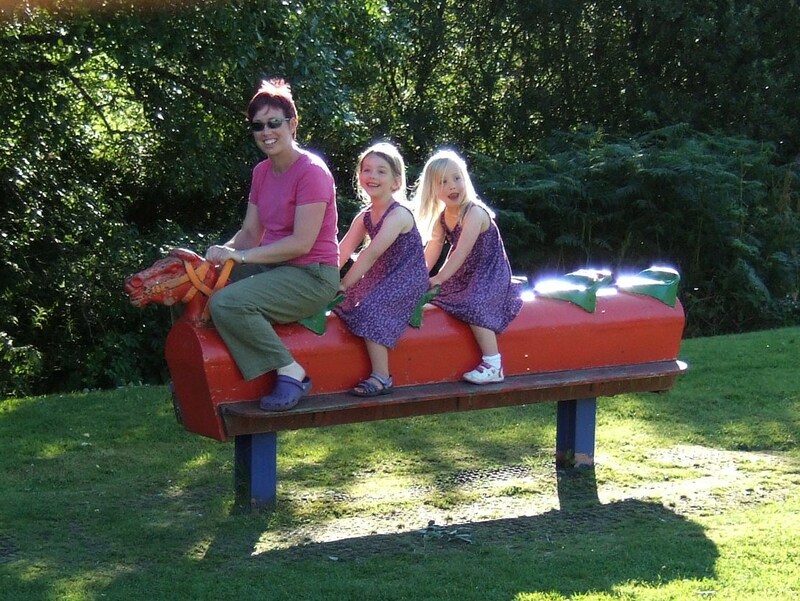 We went to Deeside Holiday Park, near Peterculter, south of Aberdeen. It was the place we’d originally planned to stay at back in March, until it dumped with snow. What a brilliant site! 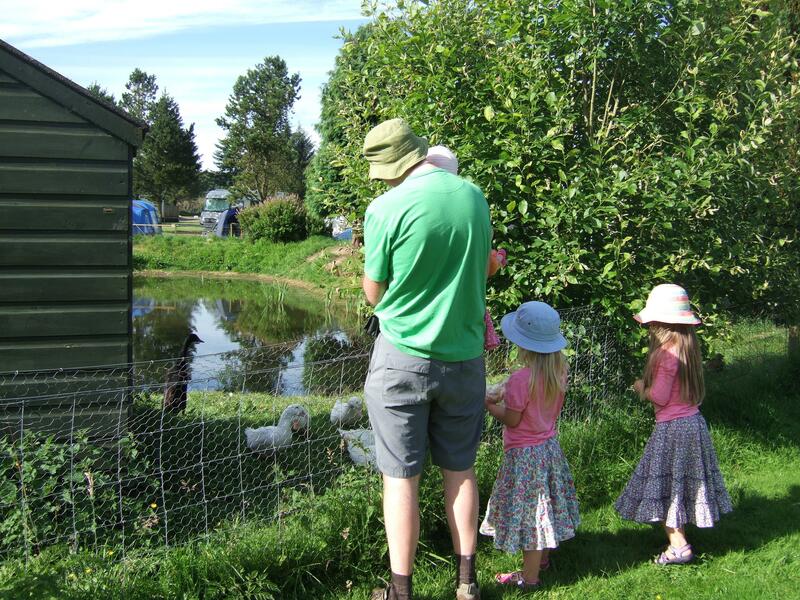 Quiet, clean, with a safely fenced-off duck pond and great, sturdy playground for kids. It was pretty busy so we drove round it looking for somewhere to park the behemoth of a tent. Then drove round again. And then asked timidly at Reception if it would be ok if we used the overspill tent field. Luckily, for them and us, it was fine. Can you imagine how much noise 3 over-excited minxes can make? Well, our poor fellow-campers don’t need to imagine (I’m sorry; I’m so, so sorry). They started screeching as me and The Boss got out the car and started to erect the tent. An hour later, with just the guy-ropes to do, and they were at fever-pitch. We took them to the playground and the duck-pond to burn off some energy, especially because Midi was just screaming loudly and randomly just for the hell of it, like an overly-sensitive car alarm. That worked a bit and they turned back into normally active kids. Stupidly, we then fed them at the Old Mill restaurant next door (not our original plan, but what you do when Someone (hint: not me) forgets the cutlery and plates!) So, full of calories, we then topped them up with hot chocolate and marshmallows. Crikey, talk about lighting the blue touch paper… After a while, though, you have to balance the racket you’re making yourself, hissing, “Be quiet! Go to sleep! For the love of God stop eating your sister’s hair! !” and just let them get on with it. You can forgive a man almost anything when he puts your coffee on the campfire before he does anything else – even fix the tent. I’m not saying that I didn’t get much sleep, but I remember that they finally quietened down around 2215hrs; and that the light rain turned to heavy rain at 0100hrs. At 0320hrs both Maxi and Midi needed potty runs. Around 0600hrs the workies’ vans started up and left, from right outside the tent door (the nice staff member mowing the lawn had warned us, but we knew we’d be up anyway). At 0720hrs I gave up and decided to get up and see how bad the rain was. 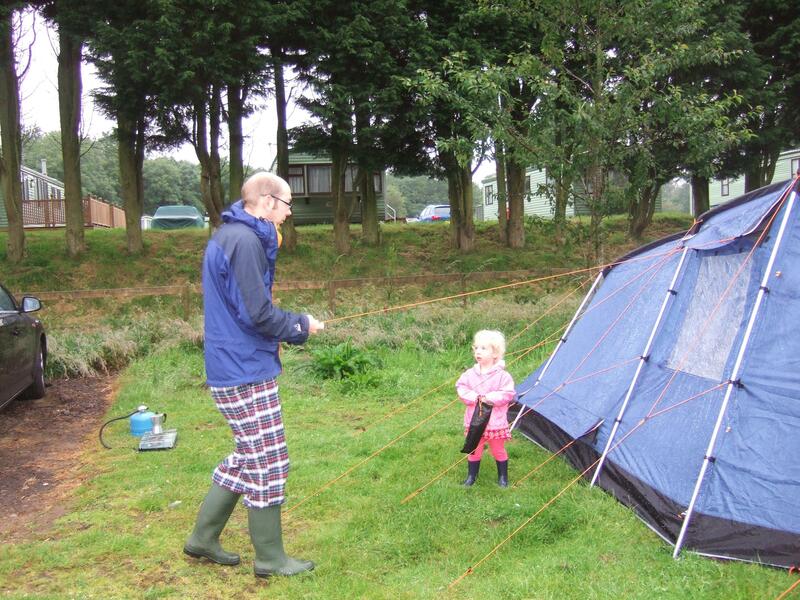 Five minutes later I realised I *had* slept because I hadn’t noticed The Boss or Mini get up and leave the tent. At 0731hrs The Boss handed me in a freshly brewed espresso and went back to fixing the tent with Mini (he’d not pegged out the ventilation flaps. Oops). And my world became liveable again. You don’t want to know what she was drawing in the condensation. Really, you don’t. – don’t forget your coffee. No matter what. Your life won’t be worth living. – the best luxury item for kids is a potty. It saves that Silly O’Clock in the morning run across a wet field just as your 4 year old pees herself. You still have to march across sleepily to the toilet block to empty it, but your minx can go back to sleep. Taking the old pink potty was a stroke of genius, I tell you. 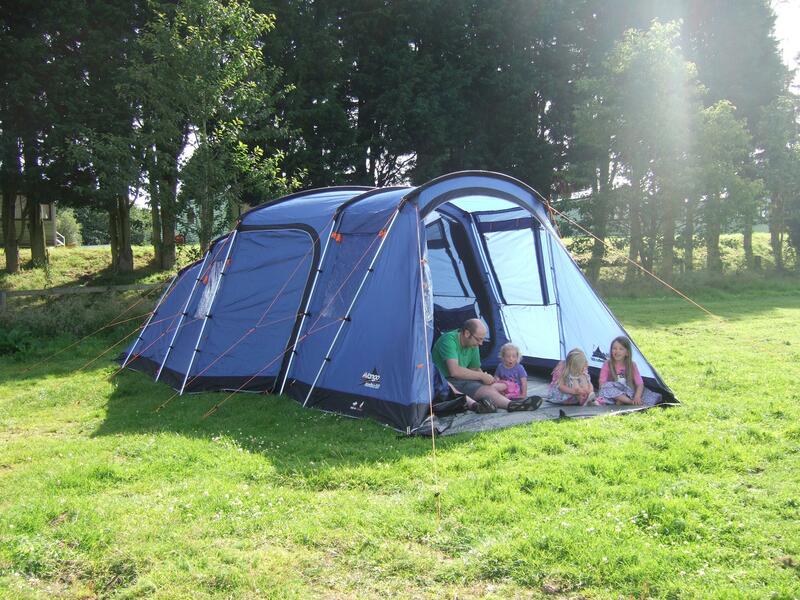 – camping brings out the muckiness in kids. Example, me and Mini Minx were cuddling up in my sleeping bag. Maxi and Midi had finally passed out. Mini was idly rooting around in her nostril. Me, exasperated: “Right, now what are you going to do with it? Where’s your bogey going to go? No…no! Aaiieeeee!” as she happily and affectionately wiped it on my cheek. Do you remember back to last month, and the start of the Olympics? It was only 27 July! I remember it. I remember the Opening Ceremony and cringeing and laughing and gasping in enjoyment, all in equal measure. We let the minxes stay up late especially to watch it. I even put down my knitting. The girls tried hard to savour being treated like adults, but at the end of the day, they’re only 6, 4 and 2… They managed 20 minutes of the country-teams parading then crashed out where they were. Poor souls – they missed those excellently comical black stick-on moustaches from the Ukrainians (? ), the Czech wellies and umbrellas, but did see me gasp and snigger in shock at the man in front of Camilla and Boris excitedly give the German team a Nazi salute or 3. I’m glad they didn’t ask me to explain. 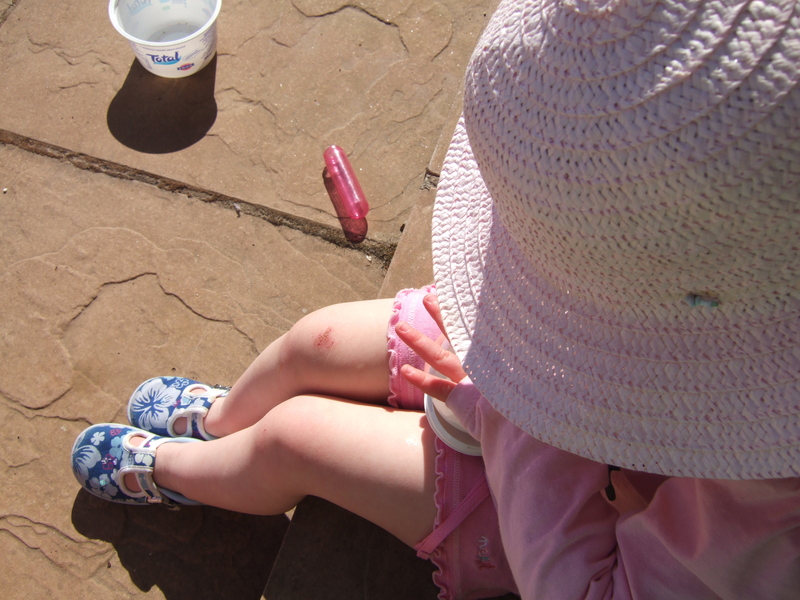 Lastly, this photo just says ‘summer’ to me as a mummy to little girls: grazed little milky-white knees that you could just eat all up, sun-hat, soft canvas baby shoes, the yogurt pot boat / bucket / weapon, and the ever-present bottle of bubbles. Ach, they’re little for too short a fleeting time! 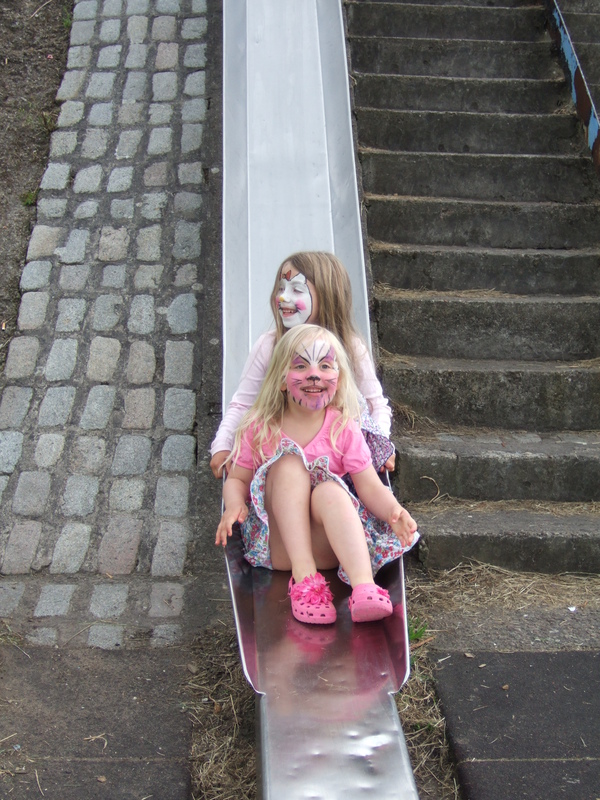 Out of the blue, we finally had a lovely sunny day, so we took the minxes to Hopeman Gala. 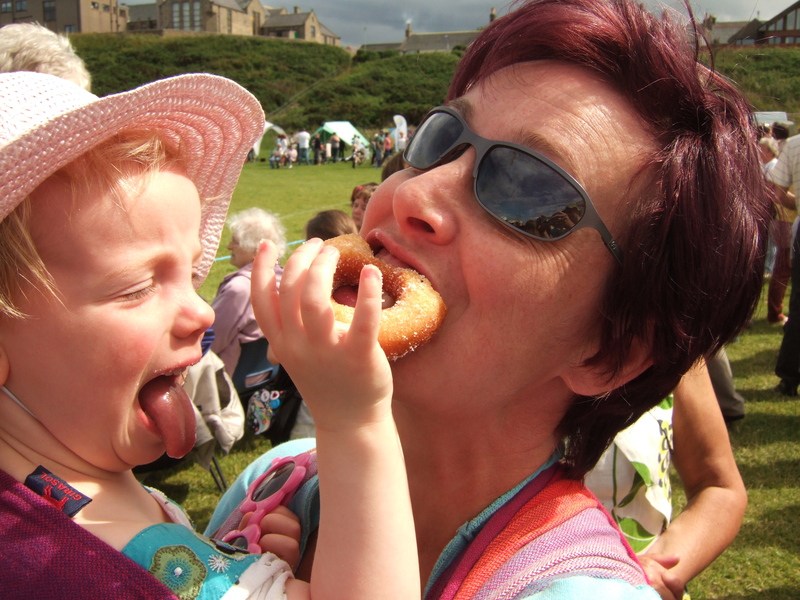 No really, Mummy doesn’t like donuts… Oh go on, then. 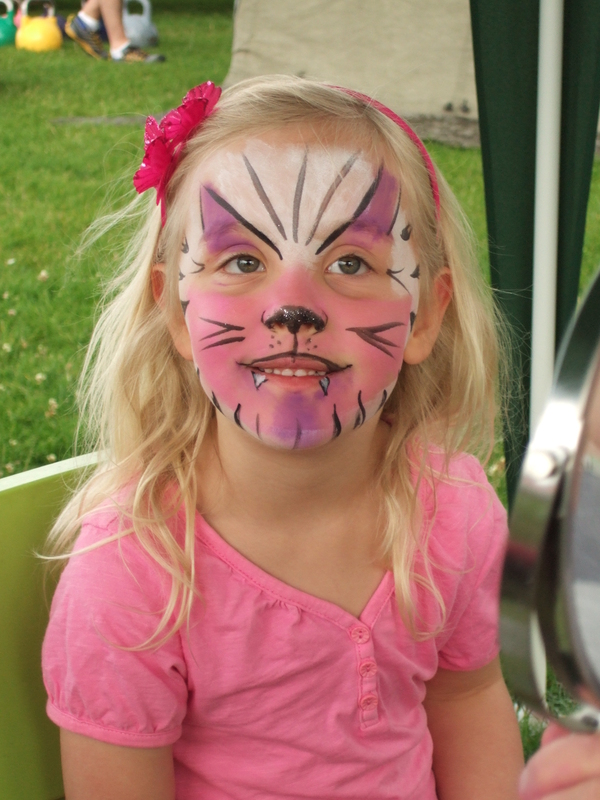 After the gala (Highland dancing, belly dancing, Tae Kwon Do displays to the inevitable soundtrack of “Everybody Was Kung-Foo Fighting”, Pipes Band and raffle) and sudden downpour that we managed to duck under the face-painting gazebo, the minxes set off to play on the swings. The Boss kindly slid down first to dry and clean the chute suitably for his little princesses. We finished the day with a Chinese Takeaway: egg fried rice and sweet & sour chicken balls. Badly wrong, but so, so tasty! Who knew Elton John liked being worn? It was only 3 weeks into the school summer holidays and we were really fed up hanging around waiting for the rain to stop. There are only so many indoor picnics and home-made bubble mix you can do with minxes! 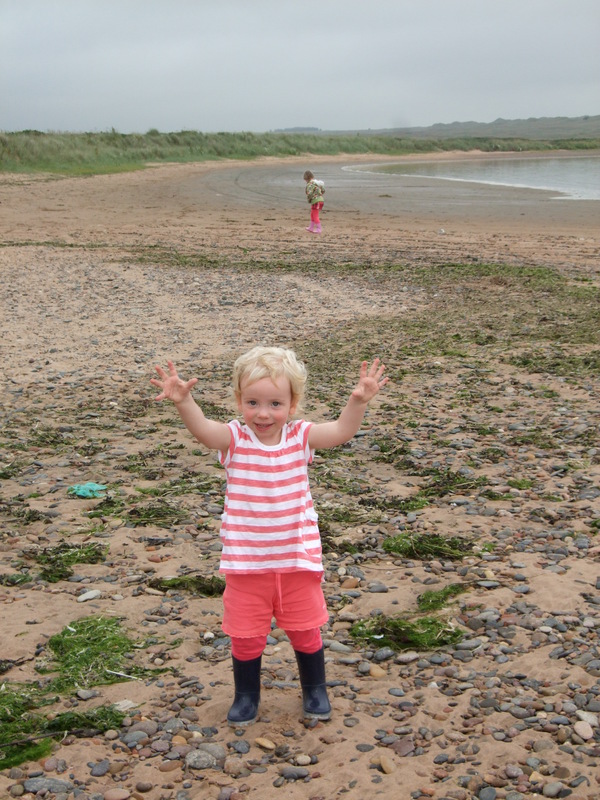 So on the first day that it didn’t pour with torrential rain, we ventured out to Lossiemouth in search of the East Beach! Midweek, on a rainy day, we were spoiled for parking spots. So I chose the prime spot – right between 2 ice-cream shops! In case the weather turned, I decided to hit the ice-cream first before venturing on the beach. I have to recommend Miele of Lossiemouth, though. Not only did they have delicious flavours, but the server was lovely when Midi Minx changed her mind about the flavour for the 7th time, right after her ‘final’ decision had been scooped and placed on the cone. I didn’t mind (yes, I think I’ll just have to have an ice cream now, after all! ), but the man insisted on giving us the ‘wrong’ one free, and gave Midi her 8th choice. Four happy minxes toddled out the shop, along the shore to Seatown, and over to the loooooooong wooden bridge to the sand-dunes. Maxi wasn’t too happy looking through the slats, and Mini insisted on being carried (all the better to rub her cherry ice cream in my hair and her jacket). Midi was too engrossed in her ice-cream to care much. When we got to the empty, golden sand, it was like uncaging wild animals: they zoomed off and rolled in it. We trotted along a little to watch the surfers and ‘walked the plank’ of a washed up tree-trunk. Four tornado fast-jets treated us to some synchronised take-offs and landings at RAF Lossiemouth. Looking over, the sky was as dark as their skins: a deep seal-slate-grey. Ominous! Still, there were dunes to climb and bum-slide down. Midi and Maxi cackled as they created ‘dinosaur tracks’. Suddenly the surfers came out the water and left for the car park. Hmmmm… what was the biggest, blackest cloud doing? Would it fall here or skirt past us? 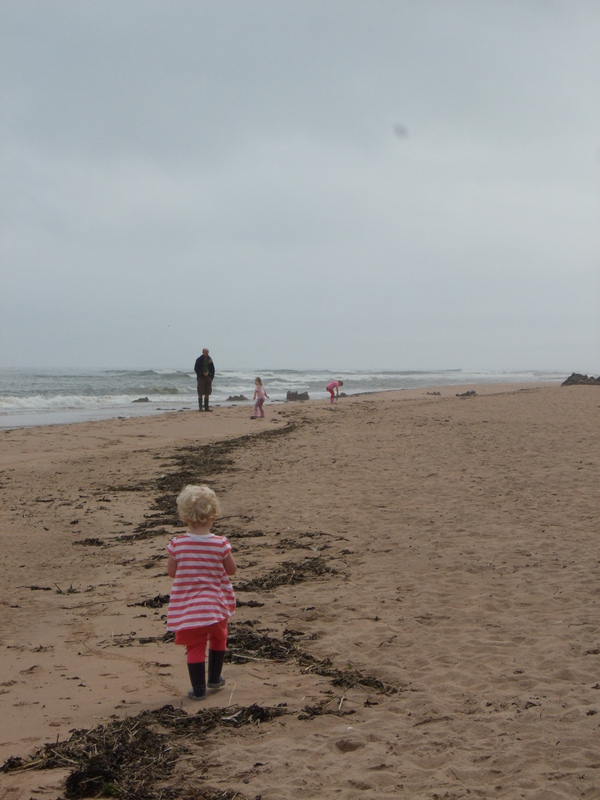 We didn’t have long to find out – the heavens opened as a sudden squall blew us off the beach. Normally I’d have taken the girls to a more sheltered bit of the beach and taught them how to stand with their backs to it and wait the shower out. But as I bent to fasten up 3 little hoods, I noticed that baby Mini was shivering violently and her little hands and lips had gone blue. 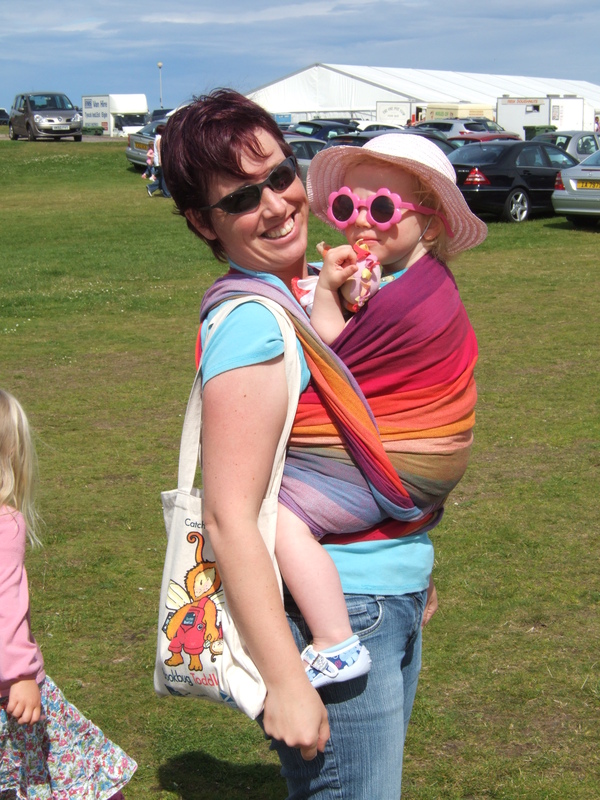 Deeply alarmed, I hauled out my trusty Didymos Carmin Fish sling (thank God I brought it after all!) and strapped Mini to my back. It left her head exposed, but gave more body heat. I got hold of the other 2 minxes by the fist and yanked them along the shore, across the bridge, and quick march down to the car. I stripped Mini of her wet clothes and wrapped her in 2 fleece layers, tucked her in her car seat, towelled her ginger curls with the sling, enveloped her in my spare fleece jacket, and gave her the picnic sandwiches I’d made her. Then did something similar to the other 2. 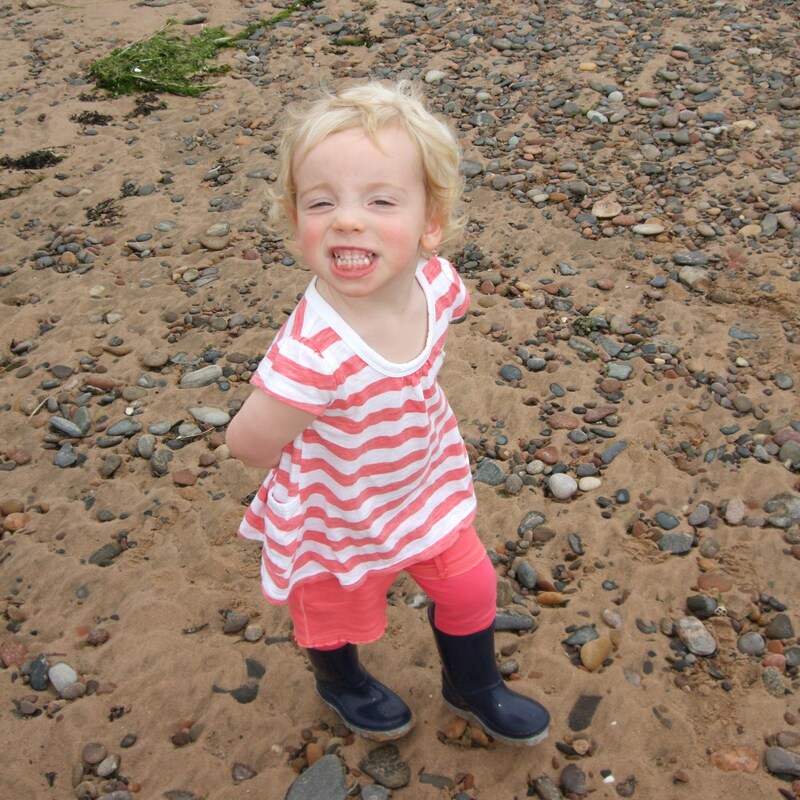 Midi had been moaning about having sand in her wellies. I took one off. As it released her foot with a ‘pop’, I got a sand shower. Her welly is a TARDIS, obviously, because there’s no way the laws of physics can explain how that much sand got into that little space. As for the folds of her trousers… well, I’m still finding sand trickles, a month later! With Mini finally pinking up again, we finished our picnic in the car, then drove home to give her a warm bath and a lovely snoozy nap What to do with the bigger girls? Well, dress them up in shower-hats and wipe-cleanable clothes to finish painting stones, of course!